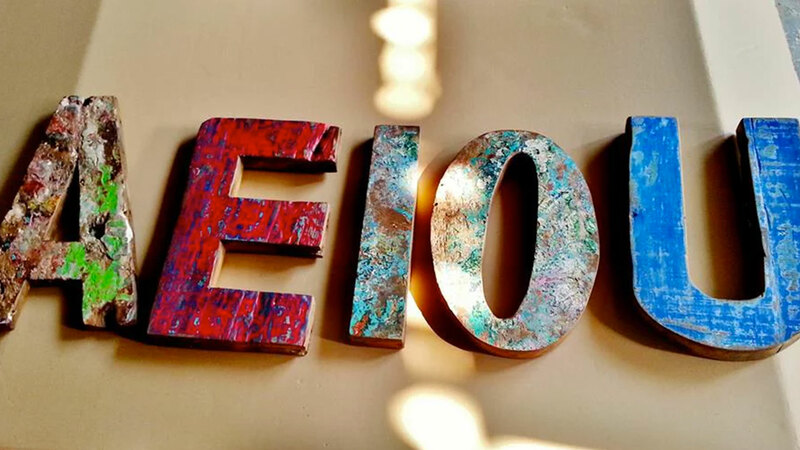 a.e.i.o.u. is a café lifestyle store themed around nature, food and lifestyle. The café and retail space rests in a shophouse at King George’s Avenue. Initially built in the mid-70ties, the shophouse used to house an antique shop. The old signage is still visible on the facade. Working closely with the owner, Chef At Work was engaged for project management to transform the entire nifty space into its current glory. So what’s the story behind the brand? Part café, part restaurant, partially lifestyle store with hints of nature and herbs, a.e.i.o.u. is a space that hopes to inspire patrons to “Enjoy life’s simplicity, consume goodly and appreciate nature.” a.e.i.o.u. are the vowels of the alphabets we all learn as children. Likewise, this concept is centred around going back to basics and a lifestyle of green conscious living. Key elements featured retro decor aiming to bring back a whiff of nostalgia into the ambience. Having a strong design background, the owner shared with us his vision to restore the setup into a vintage theme. This involved a process of sourcing furniture and decor pieces from a variety of places. These furnitures are then restored by hand, giving each piece a unique look and feel. Being a painter, the owner also featured his own works within the compound. Overall, this resulted in a unique design that is very difficult to replicate. Keeping in line with the overarching theme of the cafe, we tailored a rustic menu. This menu incorporated fresh and quality ingredients served in delightful presentations. Also on the menu are speciality cakes and drinks with a special local twist. This was followed by training the kitchen staff to prepare and whip up the delicious dishes with consistent standards. The amount of thought given to this setup not only distinguished it from the rest of the cafes in Singapore but also made copying a difficult feat. Why? Because one would have to replicate the creativity of the owner. We had a good sense of accomplishment for this setup as we got to journey with the owner from start to end. From a journey of having zero knowledge in the F&B scene, we helped them to avoid pitfalls, pick up best practices, learn and improve along the way. Till today, the cafe remains a popular haunt for crowds of all ages and demographics, both young and old, a tough feat to follow in the tough F&B scene of Singapore.